Including this in the health section may be a stretch on the one hand, but depending on how holistic your approach to health actually is, it makes total sense on another, more abstract level. According to a new computer simulation, the universe may work and grow like a giant brain. That is the tagline anyway. But the reality is at once more complex and far more simple. It has long been argued that organic systems on earth are simply a microcosm of how wider forces work at the galactic level and a macrocosm of how subatomic interactions work. The team created a computer simulation that broke the early universe into the tiniest possible units -- quanta (packets) of space-time more miniscule than subatomic particles. The simulation linked any quanta, or nodes that had any chance of interacting within a reasonable area of time and space in a massive celestial network. As the simulation progressed, it added more and more space-time to the history of the universe, and so its "network" connections between matter in galaxies, grew as well. 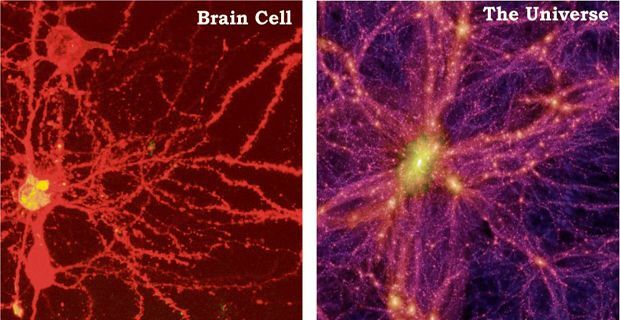 Just as in the fractals of chaos theory, hubs of activity and connectivity began to appear. Certain points developed an ‘attraction’ and concentrated activity that then fired off into more complex permutations. Think matter assembling into a galaxy and then into stars and planets. Think monocellular life in the primeval oceans coming together into multi celled organisms and on into life as we know it. Not only is this simulation one of the clearest indicators yet of self organising systems within nature, but the scientists behind the project also mapped their results onto how the internet itself works and found exactly the same patterns emerging. Now there we have some really fascinating cosmic questions. Do the manifestations of consciousness and human connectivity mirror the fundamental physical forces of the universe? Or are they in fact one and the same thing? Are self organising complex systems the key to life, evolution, and Facebook all in one go? More research please.